I have been on this urge to redo my living space. I actually like it, but it needs a bit of a transformation. We recently got an amazing media console from West Elm, and a new coffee table from Urban Home. I think getting those new items must have inspired me. I currently have seafoam greens/blues, browns, and golds. And I kind of like to stick to that palette because I love it so much. This light bulb lamp is so cool and definitely a statement piece in any home. Love this textured rug! I want something very similar to this in my living room! Storage baskets are always a good idea. Mostly because they hide any random stuff you may have lying around, or extra blankets you would like to store. I want these decor trunks just because. But they also would make a pretty nifty side table. Loving these gold book ends. So sleek and modern. Every home needs a globe, but I'm especially loving this green globe here! Can this seater sofa's color be anymore perfect??? Yes, please! Mid century coffee table's are always something I lust over. They are always so clean and well designed. So tomorrow is my best friend's 27th birthday! 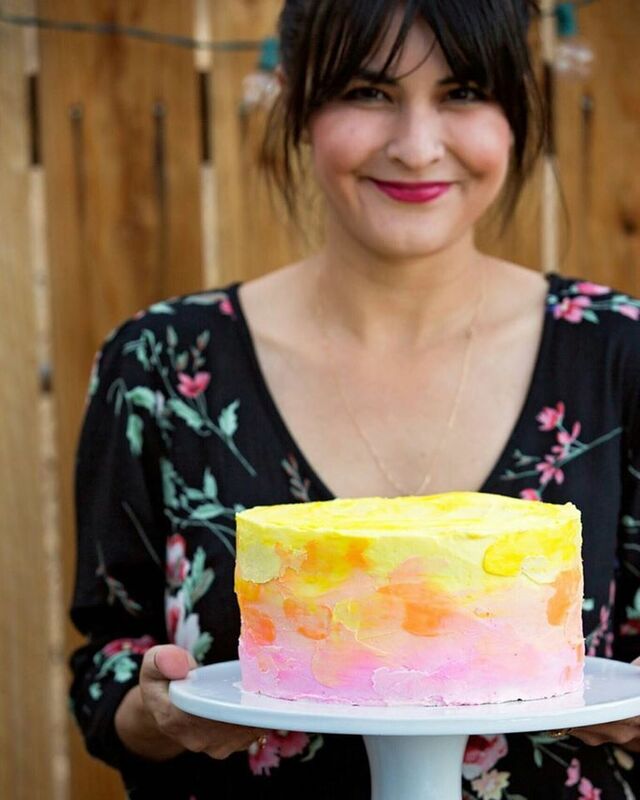 She's quite the baker, and we like to share baking ideas and tips with each other. So in her honor, I want to share a recipe she taught me. 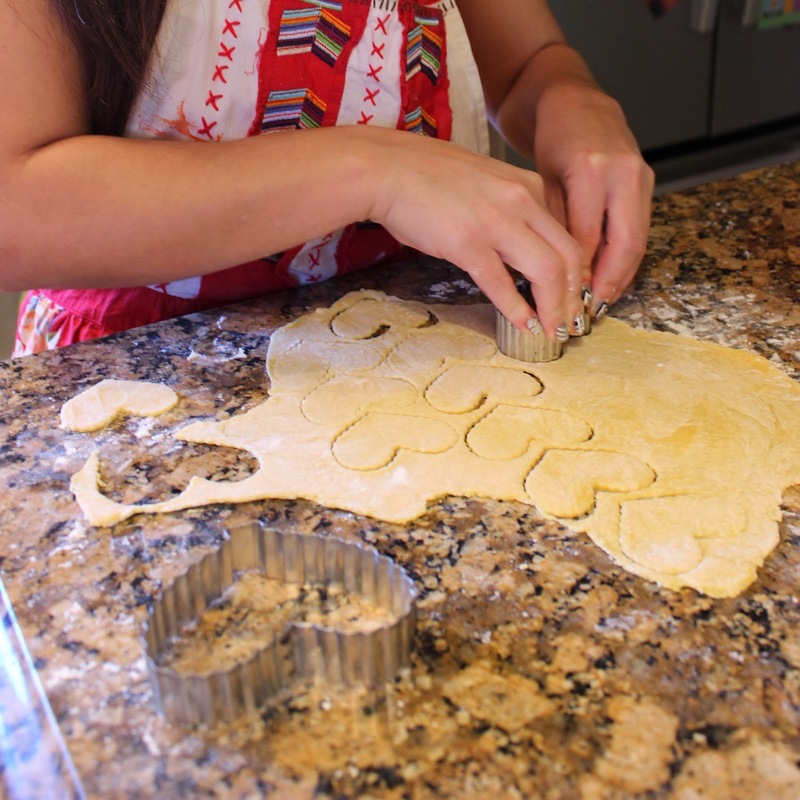 Her family is from Chile and they make so many yummy pastries! 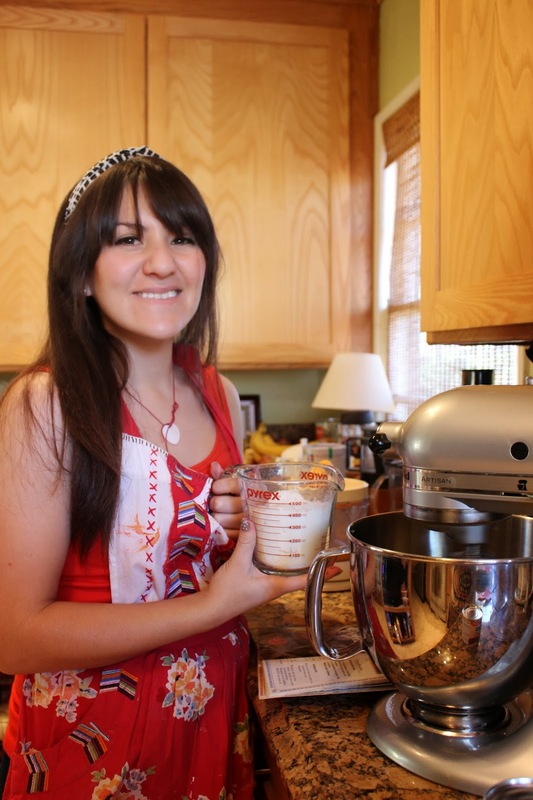 A couple weeks ago I asked her if she could teach me how to make alfajores. 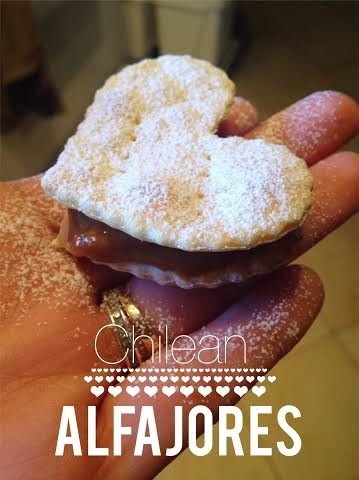 Alfajores are small sweet cookie sandwiches filled with caramel(also known as manjar or dulce de leche), mostly made in South American countries. So if you've had it before, and it's slightly different from this recipes, it's because there are a lot of variations. Mix all yolk until fluffy and pale yellow in mixer. Roll out the dough. Make sure to make it thin because when you bake, it will should bake like a cracker. Traditionally, you cut out circle shapes, but since we wanted to make it cute and in the festivities of Valentines Day, we decided to use a heart cutter. 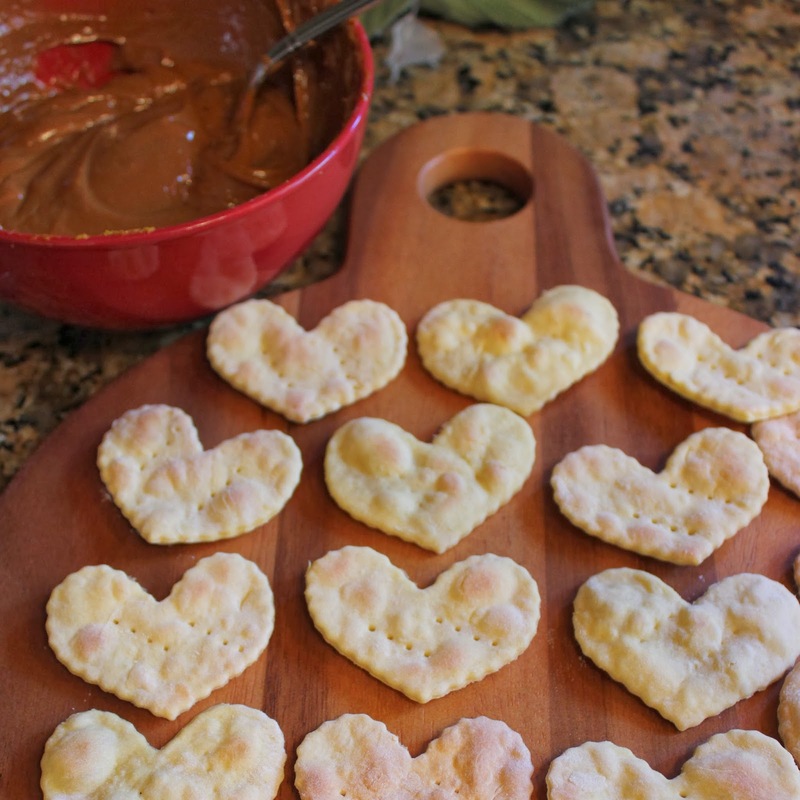 Before you bake, pinch each cracker with with a fork a few times. While your crackers cool down, open up your manjar and mix in the 1/4 cup of orange juice. Make sure it's mixed in thoroughly. Then spread the manjar on top of a cracker, and top it off with another to create a 'cookie sandwich'. And lastly, grab your powder sugar shaker and sugar those alfajores! Oh, and don't forget to taste test them! And maybe leave less obvious evidence! Haha! Tada! You're done! We also did marshamallows that day, with my all time favorite recipe I just discovered! But I will share that recipe in a couple weeks. Promise. I don't really know much about sports. I was brought up around it because my dad and brother love all sports so I kind of knew who was who, but I honestly had and still don't have any interest in it. I'm that kind of gal that usually watches sports events like the Super Bowl, maybe half a game of one of the NBA finals...I think you get the point. 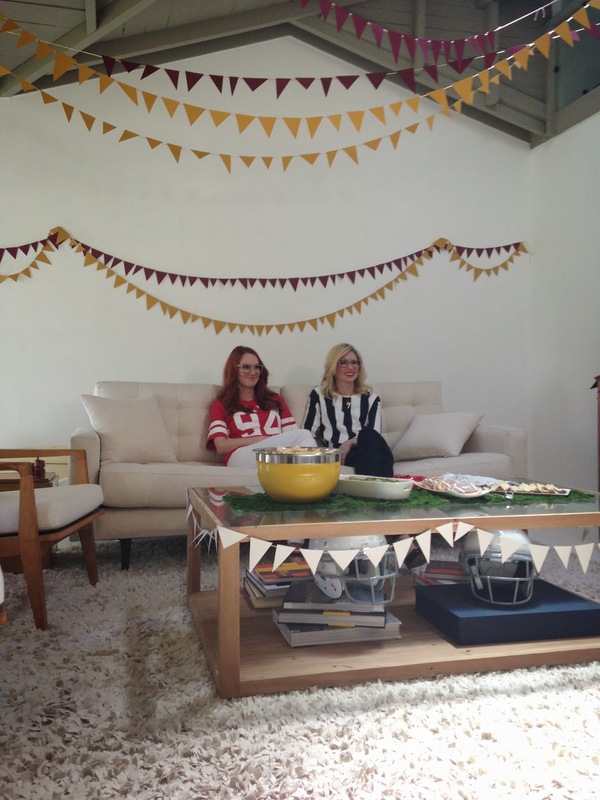 So when The Girls With Glasses wanted to do 'The Cutest Super Bowl Party Ever', I was all about it. 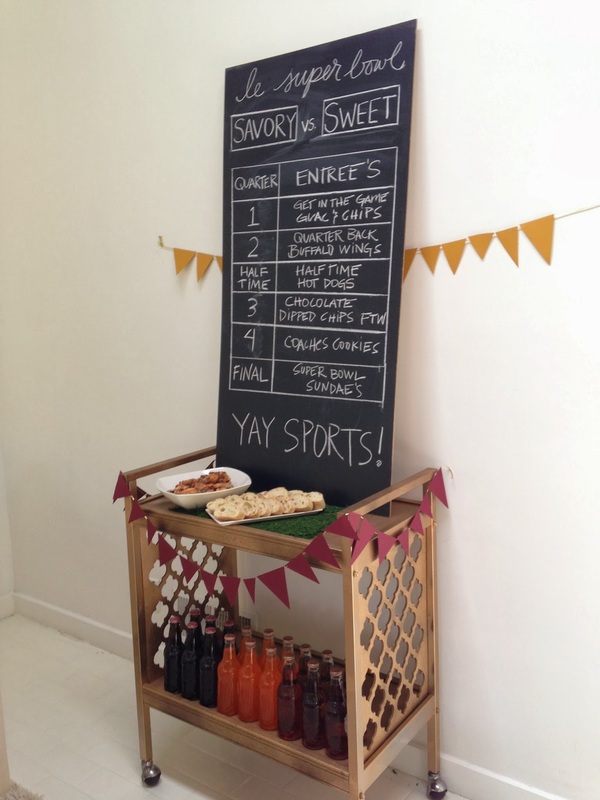 Cute decor, yummy food, and making a boring game fun? I'm in! You can watch the video here! Oh, and I make an appearance! Can you see how much of a sports fan I pretend to be? Haha! Oh jeez, my "acting" skills! This is why I am usually behind the camera! The Girls behind the scenes! Because sport scores aren't important, the girls make a sports scoreboard menu! My kind of party! And girls ready to watch 'the game'! So are you ready for the Super Bowl? This year, make it the cutest! Have you guys ever played around with washi tape? I have seen it a lot, but actually never used it until recently. I had a lot of left over tape and thought of using it for something in my living room. Then when thinking how much I hated my fireplace design, I thought...."hmmm, maybe I can make it somewhat bearable for the time being with some washi tape." So, that's exactly what I did. I decorated my mantle with some light turqoise with tiny orange striped washi tape. 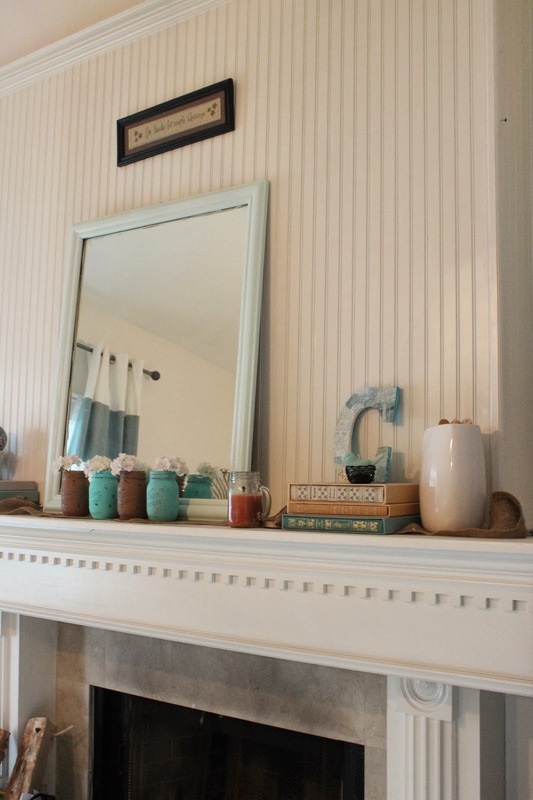 Obviously it's a temporary fix, but it makes me not hate my crazy pillared mantle anymore. 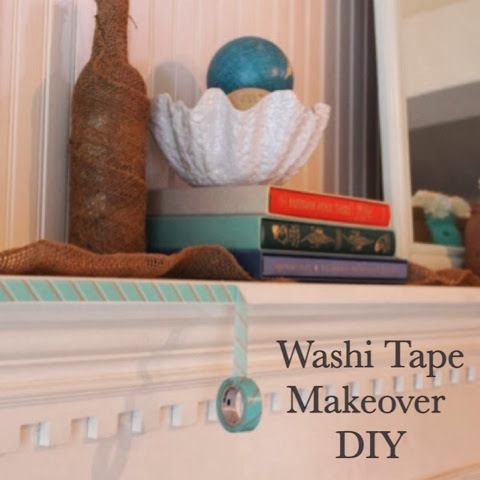 First, you need washi tape. 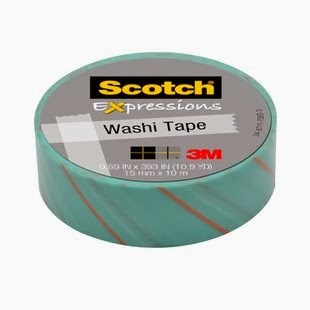 You can buy washi tape at Target, craft stores, or Etsy. I got mine at Target and it was the Scotch brand. It is more of a simpler design, but it's a very pretty color. Then you need something to make over. This mantle of mine needs to be in a museum and possibly never come back. It's so 90's! It in dire need of a makeover! Then decorate and design away! The edge of my mantle is actually the same width of the tape so it worked out perfectly. I also added it to the bottom square trimming underneath because the design is not my favorite so I decided to cover it up. And here's the final product. Kind of looks painted! I love it because it's such an easy DIY without mess or commitment! My kind of project! I'm sure you have all heard of Rifle Paper, but if you haven't, they have the most lovely designs you have ever seen! It's mostly stationary, and some gift items. I love it all! I wanted to share some of my favorite items they have now on their site! But let's be honest, it's all amazing! 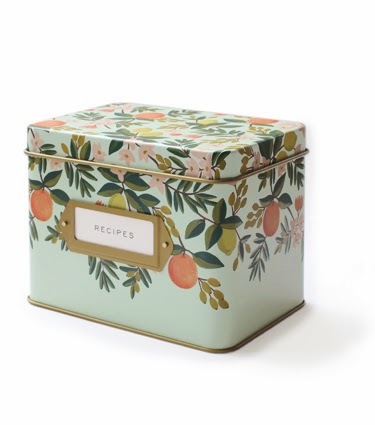 I love this citrus recipe tin. It's perfect for any kitchen! This awesome Los Angeles print is the best way to show your love for this city. 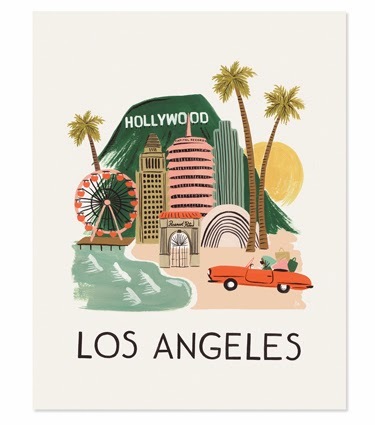 I am from L.A. so this print speaks to me, but they also have other prints from major cities too! My next phone case. 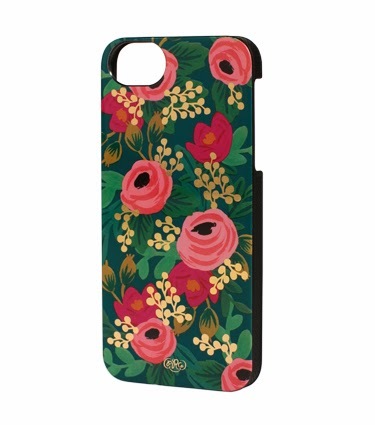 I am in love with this floral pattern! 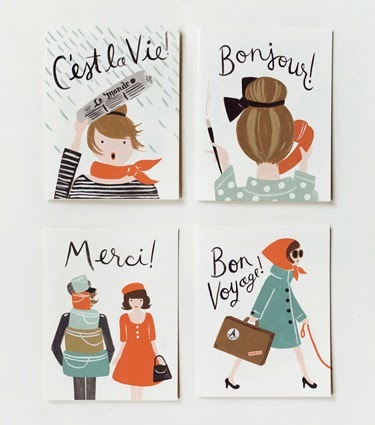 These assorted French cards are adorable! I just want to frame them and may never want to give them away. 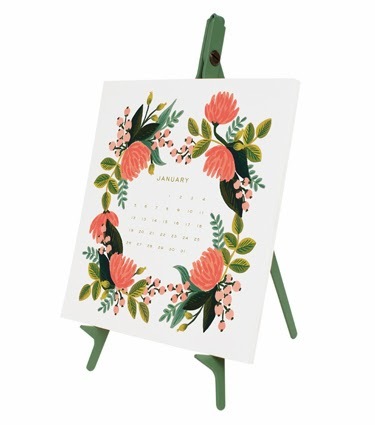 These calendars are just so pretty! Would make any desk look lovely! Now, to choose one item. Not possible! Happy 2014! I guess I haven't posted since the 31st! Oops! Well, theres no update at the moment on our bathroom. It's still demolished without progress. The reason being is that we are waiting for the city to approve our plans, and had to get an architect to draw them out. This whole process feels tedious, and I am trying to be patient, but the whole master bath and walk-in closet loss is making our life a little tricky. We currently have all of our clothes in our spare bedroom. It looks like a mess! And the bathroom we are using, thankfully, is upstairs next to our room. It is smaller with less counter space, but we are making it work. Having a Tim Gunn moment! Anyway, in the meantime I am throughly thinking on the style of our bathroom. Here are some of my bathroom inspirations! 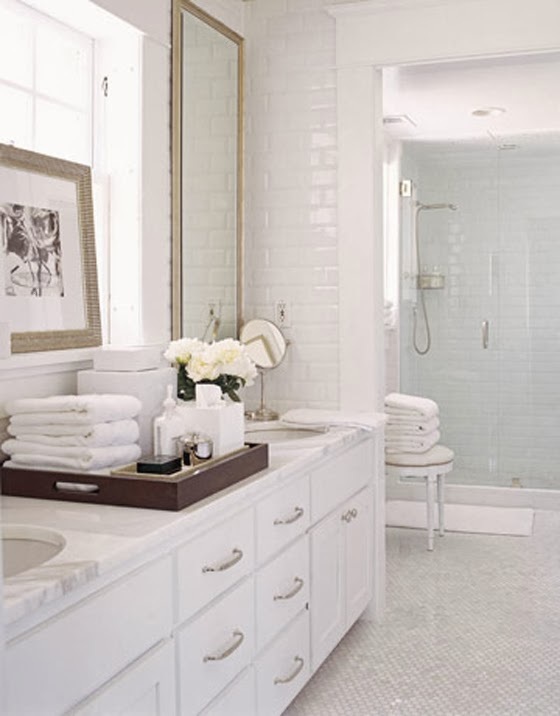 This bathroom is so pretty! 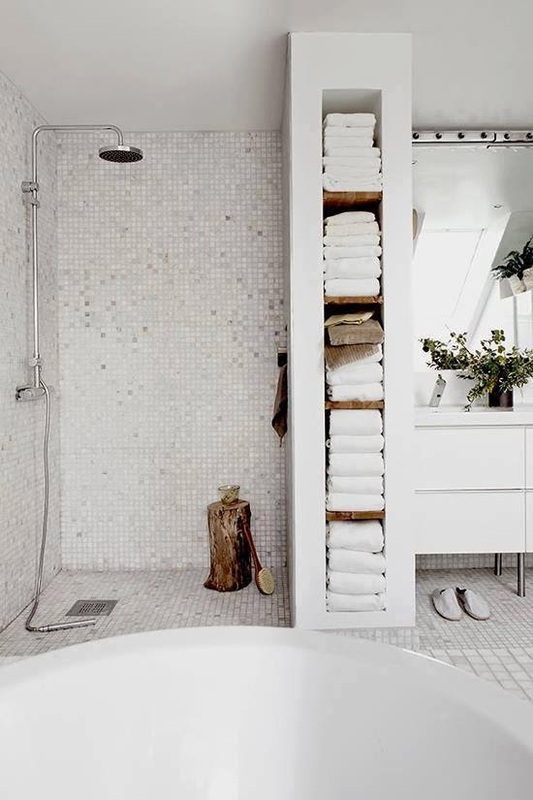 What a lovely bath area! All these bathrooms are so inspiring!! !